The Farrelly Brothers have never been known for their morality, but with the crude bowling flick Kingpin, the comedy-loving siblings drilled their lowbrow sensibilities below sea level. 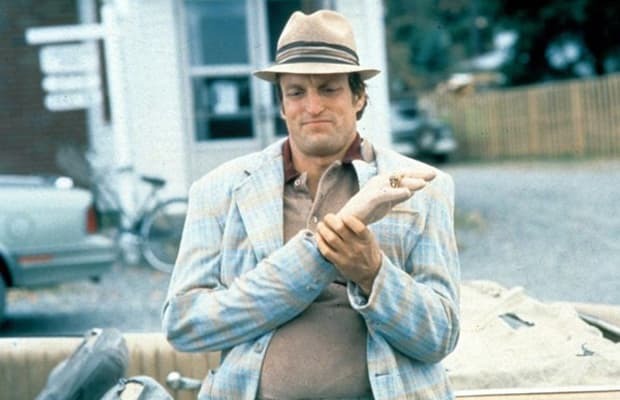 With a prominent mean-spiritedness, the brothers darkened their usually lighthearted humor considerably in this gross-out The Color Of Money, about a disgraced former bowling champion, Roy Munson (Woody Harrelson, in one of his best, and, yes, most underrated performances) who hopes to vicariously gain respect through a middle-aged Amish prodigy, Ishmael (Randy Quaid), and deliver humiliating payback to the arrogant current champ, Ernie McCracken (Bill Murray). But, of course, Roy's path to redemption, guided by his hook-hand, is a bumpy road covered with one dirty set-piece after another. At one moment, he's forced to sleep with his vile, elderly landlord; the next, he's unknowingly milking a bull with his mouth and slurping down a bucketful of the bull's, um, sperm. There's no delicate way to phrase that. It's all incredibly absurd, vastly offensive, and always hilarious, thanks largely to the cast's uniformly strong acting. As the slithery villain, Murray revels in his despicable character's awfulness (McCracken's obnoxious TV commercials are highlights), and Harrelson, blessed with a multifaceted role, manages to earn sympathy even as he continually spits all over good taste. With Kingpin, the Farrelly brothers didn't just make the best bowling movie ever-they cranked out one of Hollywood's most under-appreciated "bathroom humor" flicks.